Yeah, but: How interesting can setting up a printer be? 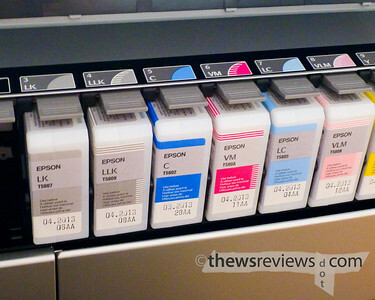 The Long Version: There's not a lot that I can add to the existing reviews of the Epson Stylus Pro 3880; over the past two years it's been in solid use by people who are better printmakers than I'll ever be. All I can really report on is the experience of upgrading to it. After all, as my mother always said, "Why would I want to listen to people dumber than me?" 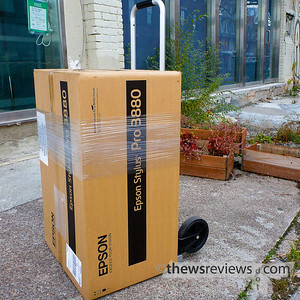 The Epson SP3880 makes a powerful impression right from the very beginning: the box that it comes in is a monster, and it's not filled with helium. It's manageable with a certain amount of preparation, but it's not an impulse-buy item unless you already own one of those large "car" things and found a nearby place to park it. Personally, I just strapped it to my faithful folding hand truck and walked it a mile and a half – all uphill – to get it home. With that hurdle out of the way the next task was to set it up. The Epson 3880 can make prints that are 17" wide, but the printer itself is only an inch wider than the 13"-carriage Canon Pro 9000 mk II that it replaced. This makes the SP 3880 quite easy to live with. The biggest challenge of installing it is finding and removing all of the tape that holds the various bits in place during transit. Canon uses orange tape, and I still missed a couple on the 9000; Epson's tape is a translucent dark blue that's not blindingly visible on (and in) the black and silver printer. I count 49 pieces from mine, including the ones that hold down the spacer blocks and foam, but your results may differ. Epson includes a fold-out quick-start guide, which I used, as well as a proper spiral-bound manual. It's great to see a printed manual these days, and while I can't remember what I checked it for, I did look at it once when I was setting everything up. It's one thing to read that the 3880's ink tanks hold 80ml each, and it's something else to see all nine of them together. The printer contains almost as much fluid as a bottle of wine, and given that they're somewhere north of $500 for a full set, it's a mighty nice bottle of wine at that. But on a price-per-millilitre basis, that still makes the 3880's ink cheaper than any other printer that I've ever owned. It's nice to have economies of scale working in my favour for once, even if these tanks are small when compared to the bigger printers out there. Printing with the 3880 is quick and quiet. The question of print quality has been ably addressed by reviewers elsewhere, so as a newbie all I can add is that I've been impressed without being blown away. The 3880 is a very very good printer, but that still isn't an earth-shattering upgrade from a printer that's merely very good. What pleases me is the speed and predictability of the output, with durable prints that don't have any of the problems inherent in the dye-ink printer that it replaces. As my printing ability improves, I have no doubt that I'll learn more about just how good the 3880 really is. 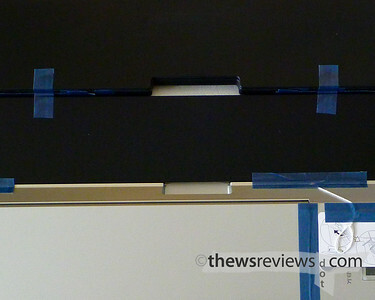 Given my previous determination to move to the Canon Pro 1, buying the 3880 came as something of a surprise. The biggest disadvantage of the Epson, the ink wasted in switching between the two blacks, went from critical to irrelevant when a multifunction office printer joined the family. And with that out of the way the ability to make larger prints became too tempting to pass up. The established track record of the SP 3880, and its relative popularity, also ensures easy availability of ink and broad support from paper manufacturers. But what really cinched the deal was Epson offering a $300 rebate. Despite knowing that mail-in rebates are essentially scams, it's still hard to pass up the chance to have four-and-a-half extra ink tanks for free.